Manchester City's time has come in Europe. The Champions League draw has opened up for them. They have never had a better chance to win the trophy and - no matter what happens in other competitions - there will be a lingering sense of missed opportunity if they do not go all the way this season. Pep Guardiola is fooling no one when describing City as underdogs - or "teenagers", as he put it this week. Such attempts to reduce the pressure will not work. He knows his City reign will be judged on Champions League success. Established clubs such as Real Madrid and Bayern Munich are out. Paris Saint-Germain fluffed their lines again. Barcelona are the only club remaining to have won the competition in the past 10 years. Juventus, Porto, Ajax, Manchester United and Liverpool are historic winners, but not with their current line-ups, as they seek to revive old habits. In terms of recent European success, all the teams left, barring Barcelona, are relative novices. City are the best equipped to put a fresh name on the most coveted European trophy. 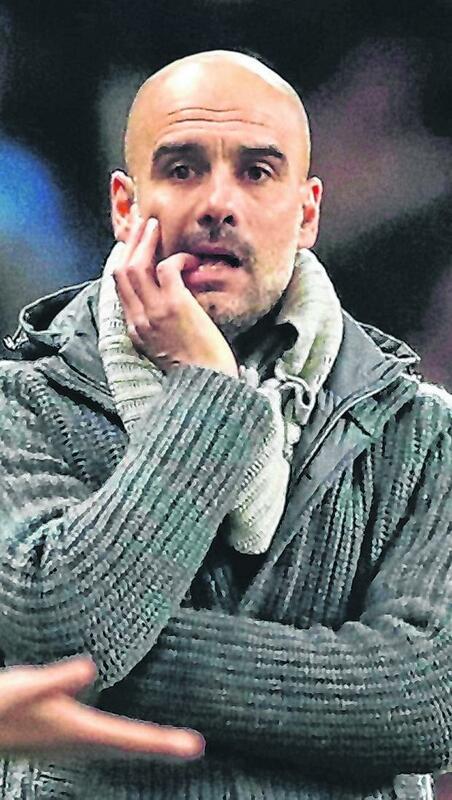 There are three clubs Guardiola would have most wanted to avoid in the quarter-final - Barcelona, Manchester United and Liverpool. A trip to Barcelona would have been too much of an emotional distraction, the tie dominated by Guardiola's Nou Camp reunion and the separation between his professional loyalties for City and enduring passion for the club who made him. United would have brought similar hype distractions, a city derby having a psychological intensity that could have been physically draining on a team still competing in three competitions. Guardiola may never admit it, but he will be delighted to have avoided another trip to Anfield, too. Imagine the hysteria that would have provoked amid the ongoing head-to-head in the title race. City's ambitions were ended on Merseyside last season and no side have caused so many problems - or forced Guardiola to change his tactics - as much as Jurgen Klopp's over the past 12 months. Tottenham Hotspur have the quality to hurt City, but over two legs I feel Guardiola's side will be too strong. Mauricio Pochettino will need to take a big advantage into the second leg, hopeful his players can immediately settle into their new stadium and make that work in the same way as Anfield for Liverpool a year ago. If they fail to get a positive result at home, the belief will be sapped from Spurs. That could affect the league meeting between the clubs, too. Three games in 10 days against the same club can have a demoralising effect if one team has the upper hand throughout. The Champions League will be Guardiola's obsession while City manager. To win it with two different clubs will underline his greatness. In many respects, it would be an even more impressive achievement than lifting it as Barcelona coach. Guardiola's Barcelona side were one of the greatest of all time, but Lionel Messi will always be its symbol. There will be those who will say it was the players - particularly one truly great player - who made those wins possible (something I do not agree with). It is the same for those managers who coached Cristiano Ronaldo at Real Madrid. When players are that extraordinary, there is always a debate as to how much influence the manager really had. Winning the Champions League with City will be distinguishable because of the coaching achievement, bringing together a group of young, developing players and seeing them mature into European champions would give perhaps even more satisfaction. He will be setting a new bar for the club. It's something he was unable to do at Bayern Munich, which affected how he was perceived when he left. Cynics will always point to City's spending power, and the Financial Fair Play allegations will cast a shadow over this era if they are ever proven, but they will never damage Guardiola's standing should he bring the Champions League to the Etihad. Although the club have invested heavily, their record signing is £60 million for Riyad Mahrez. They have bought shrewdly rather than hunted those considered the best in the world - a contrast to PSG with their lavish pursuit of Neymar and Kylian Mbappe. Others have spent more on individual players. Players such as Leroy Sane, Raheem Sterling and Kyle Walker did not move to City as the finished product. They have gone up several levels under Guardiola. The outcome of the last-16 ties have triggered a conversation about the shifting power in Europe, especially with Real Madrid and Bayern Munich outplayed by Ajax and Liverpool. In reality, the competition is heading towards a showdown between emerging forces and familiar faces. Ronaldo and Messi - the greatest goalscorer of all time and the greater player of all time - show no sign of giving up their dominance of European competition, their individual displays in midweek further demonstrating their exceptional skill and motivation levels. They bring belief to their clubs and fear to opposition. The fact remains unless the English clubs can find a way to stop Ronaldo and Messi, this year's final will be Juventus versus Barcelona. I believe the English can and will overcome Ronaldo and Messi this season. I believe two English clubs will make it to Madrid and the Premier League will continue to have at least two participants in the semi-finals for the next five years. Should Liverpool get past Porto, Barcelona would need to overcome two English clubs to reach the final if they defeat United. That is a tough ask for the Spanish giants.